On December 25, 1929, Alton Stewart, who popularized flying in North Carolina, died in a plane crash. Stewart had been at the helm of a flight that originated in Raleigh and stopped in Angier to pick up passengers. As he approached the fairgrounds in Dunn, he made a steep climb before plunging into the ground. Stewart interest in flying came from his time at Camp Bragg’s Pope Field during World War I. After the war, he began flying regularly and, beginning in 1924, worked with Curtiss-Wright Flying Service in Raleigh. 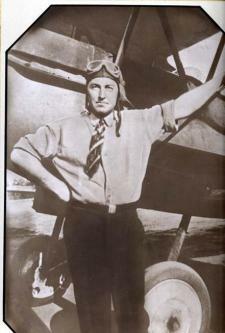 Stewart often gave public exhibitions and became one of the best-known pilots in the state. He helped plan airfields in Goldsboro, Marion, Rocky Mount, Gastonia and elsewhere across North Carolina, too. 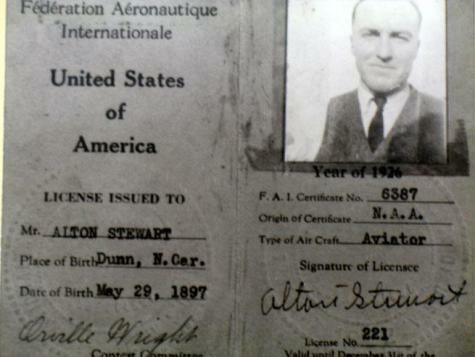 Stewart enjoyed exposing average folks to the miracle of flight. For as little as three dollars, he offered cockpit seats to passengers so they could have the thrill of racing through the clouds. Press accounts of the period give him considerable credit for popularizing aviation in the state.